Super Hero Boy: Brideshead Revisited leaves me wanting more! Brideshead Revisited leaves me wanting more! Though I can't say I've ever read the book, though its been on my to do list for a long time, Brideshead caught my attention many years ago when I caught a glimpse of the TV series produced for British TV. What really stood out to me about this series is the fact that it came out in the early 80s and it caught my attention as though its never right out discussed its the first time I ever really saw or understood homosexuality though at the time I was really too young to understand exactly what it meant to be gay it was the first time I saw a man obviously in love with another man. Lets back up though as Brideshead deserves so much more attention than the fact that one of the characters is blatantly homosexual and that's not at all what I want to talk about when it comes to this movie. Brideshead Revisited is the movie rendition and though its not the same production as the made for TV series it is based on the same book. Brideshead Revisited will keep your attention from the moment you turn it on and rightfully so as its an incredibly complex story that really needs to be digested for every moment to fully appreciate its certainly not one of those movies in which you can just casually watch and appreciate. The story starts with Charles who is off to college at Oxford, his father is really completely tuned out when it comes to his life and I'm not sure he even knows where his son is going to college or really anything about his son other than occasional pleasant conversation. So when Charles meets the incredibly wealthy and very intense Sebastian he is immediately drawn to him. Sebastian is outwardly gay, obnoxiously wealthy, and feels condemned by his mother and his religion. Though he never outwardly says it you can tell that he immediately falls in love with Charles and brings him to meet his grandmother at Brideshead his beautiful and expensive family estate. Charles however is strait, and though he enjoys Sebastian and obviously cherishes their friendship, Charles is in love with Brideshead and the complex family relationship Sebastian has with his family not to mention Sebastian's sister Julia. The story follows Charles's story for several decades from his college days with Sebastian, to his love for Julia that is strictly forbidden by their mother as Charles is not Catholic. The story follows Charles all the way into adulthood and him entering the war. I loved every second of it the only problem is it ends too soon and I feel the overwhelming urge that there is so much more to the story. I guess its about time to rethink reading the book. 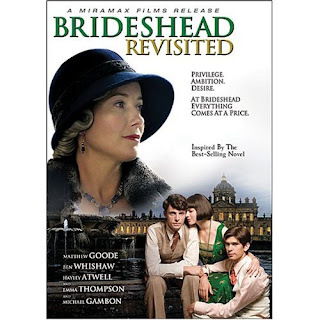 Brideshead Revisited is available on DVD and you can pick up your copy on Amazon! Would you believe this was my favorite book when I was in jr high?! I am so curious to see this adaptation. Its really great.. I've never read the book though I really have to now as I loved this movie but I've heard from others who did read the book it was a really good adaptation.